Two games were run at this Springs Recruits. Both games went very well with a Sci Fi twist added. The Sci Fi twist was the addition of some robots, from whereabouts and time unknown, appearing and causing problems for the two sides fighting. 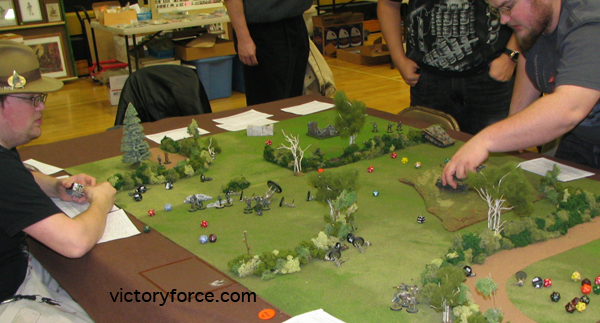 The rules used were Full Metal Heroes WWII, A Choose Your Rules Game System. In the second game, the robots appeared right away. Both sides, as before, attacked the invaders, but the Germans also continued their attack on the Americans. The robots did not last long in this battle and the game for the most part, was a straight WWII game. 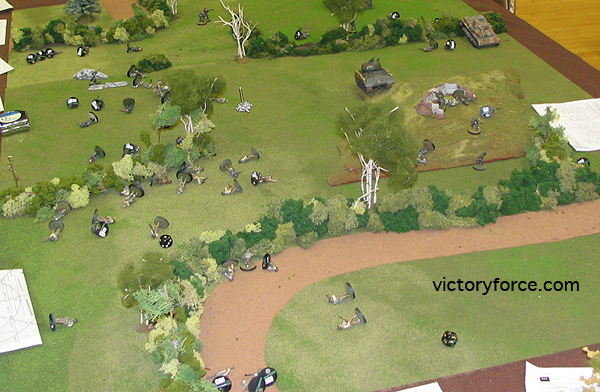 This battle went back an forth as squads of men fought for one hedgerow and a small hill in the middle of the table. The Americans took the hill, but holding it would be another thing. The hedgerow changed hands a few times until only a few soldiers were left to fight for it, with the Germans ending up claiming it. The battle ended with the Americans fighting to the last man on top of the little hill. In the end, the battlefield was covered with casualties and the Germans claiming a costly victory. Note: In both games Raking Fire was devastating, in fact its use against the robots in the second game is what started the quick defeat of the robots. The MG teams were knocked out early in each game either by the robots or the other side. The high value of the MG meant the German side would always try to man the gun many times, sometimes they would, only to be knocked off it again. I enjoyed putting on both games, and wish to thank everyone who participated. 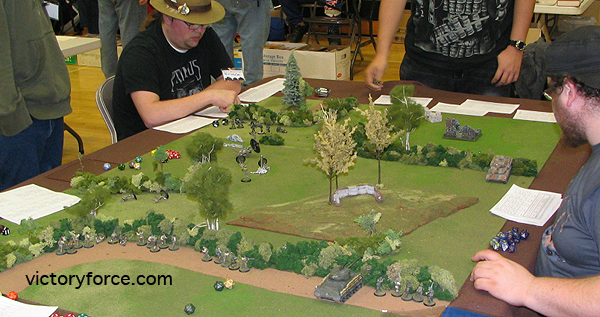 This entry was posted in Conventions and tagged 28mm, conventions, full metal heroes WWII, game. Bookmark the permalink.